Please accept my blessings. I beg to acknowledge receipt of your nice letter dated 18 March, 1970, along with a check for my book fund paid by blessed Roy Richard. I am enclosing one letter to him herewith, which please hand over to him. From the description of your letter it is to be understood that things are going very nicely in your center. Our line of action is very simple, and if you stick to the principles, then success is sure. Regarding your question about the various demoniac species of life: the Lord's condemnation, although appearing to be very harsh, is not so. The Lord being Absolute, His condemnation is as good as His blessings. Whenever the Lord or anyone of His pure devotees condemns somebody, it is to be taken as blessing. You know that the great sage Narada condemned the sons of Kuvera to become trees, but as a result of this, they were able to see Lord Krsna which is very difficult even for the great mystic yogis. You have been a little bit perturbed that the demons are eternally condemned, and I thank you very much that you have been compassionate with the demons. That is the sign of Vaisnavism. The Lord may condemn the demons, but because the Vaisnavas are there, there is ample chance for the demons to become blessed by the devotees of the Lord. The devotees of the Lord are so powerful that each and every one of them has the power of delivering many demons, even condemned by the Lord. The preaching work of Krishna Consciousness Movement is specifically meant for delivering the demons. Therefore, if you remain faithful to the Lord, you shall be able to deliver many such demons. So there is no cause of being disappointed because of the demons being condemned by the Lord. It is the duty of the devotee to deliver them. And the Lord is so powerful that through His pure devotee anyone can be delivered, never mind how he is fallen or condemned. I think the answer of your question is now clear and you can do the needful. I have gone through the newspaper articles sent by you, and they are very important. Continue to work like this in cooperation with Dininath Prabhu who is a very good devotee. Prabhavati's husband, Harer Nama, is here in L.A. now. Please convey my blessings to all the Prabhus there working under your good direction. 2) My last departure from India was on 13rd December, 1967. 3) The ``P'' Form No. and Reserve Bank of India Permit No. is as follows: EC. CA Pass 4599/2-67, dated 18th November, 1967, approved. 5) Purpose of visit is missionary preaching of Bhakti cult. You have received my letter dated 3rd March, 1970, but you have not mentioned anything about my letter dated 28th February, 1970. In the meantime, I have also sent another letter dated 18th March, 1970. Kindly reply these letters at your earliest convenience and oblige. Please accept my blessings. I beg to acknowledge receipt of your letter dated 15th March 1970, and thank you very much for the check of $30 contribution to my maintenance and book funds. I am so glad to learn that your efforts to raise contributions towards a nicer temple are now meeting with some good response. Now the Washington devotees have appeared on the television several times, so the public will be inquiring more and more what is this Krsna Consciousness movement. And you say that several hundred people joined in chanting and dancing during the eclipse. All these things are very much encouraging to me. The key to your success is firm conviction combined with sincerity of purpose, then push our Krsna Consciousness movement with unflinching determination. Do not feel inferior complexity. When Krsna will give you chance, you will do more than others are doing. But whatever you do, do it nicely in Krsna's service, and Krsna will bless you. Washington is the capitol of the U.S.A., so your center should be just befitting the position of Washington. If sometimes you come here and see the L.A. Temple and their activities, I think you may improve in your activities. Please offer my blessings to Madhusudana, Kancanbala, Dinesh, Visnu Arati, Denise, and all the boys and girls there. Please accept my blessings. I beg to acknowledge receipt of your letter dated 17 March, 1970, with enclosure, and it is very satisfying that you have introduced Sankirtana Party procession in the public streets and parks on the occasion of Lord Caitanya's Birthday. It is a good addition to my missionary activities, and I thank you very much. In the London streets, introduction of Rathayatra procession, as well as Lord Caitanya's Birthday ceremony procession, and in the most important part of the city, a Radha Krsna Temple--all these things are great achievement of your London Yatra party, and personally I feel a great credit for me because by such activities my Guru Maharaja is certainly very pleased upon us. So whatever progress we are making by the grace of Bhaktisiddhanta Sarasvati Goswami Maharaja, we must stick to them and make further progress. I am enclosing herewith two pictures of our new church buildings, which we are going to purchase at the cost of $225,000; down payment, $50,000. The whole debt has to be cleared off by twelve years. So the management here has taken a great burden upon themselves, and similarly I am awaiting the days when London Yatra party, headed by you, will have a similar achievement in London. What happened to that application you submitted for the old Oxford church? I think these Christian people do not like our advancement in the preaching work. Never mind, we shall depend upon Krsna and march on progressively. I have received word that English citizens can fly to Australia as immigrants, and the cost is only $20 per person. So under the circumstances, you can send some Brahmacaris to help out our new center in Sydney. This will be best because the British government will bear the expense of their transportation. Also you can help them out by sending them the papers of ISKCON, Ltd. from London, so they can immediately incorporate as a Commonwealth branch. The Sydney address is as follows: ISKCON Temple, 26 Horderns Place, Potts Point, N.S.W. 2011. Regarding the manjiras, I am surprised that the custom duty is cent percent. I do not know what does it mean. The whole consignment is worth L50, and they want to impose the similar amount as custom duty. In India, although our country is advertised to be very poor, the custom duty is not more than 30% on such articles. I think there is some misinformation about this consignment. Please inquire scrutinizingly. Please accept my blessings. I beg to acknowledge receipt of your letter dated 3 March, 1970, and have noted the contents. Since you have requested me so often to go to Hawaii, I must go, there is no doubt. It only remains for you to let me know when is the best time for my coming there. Of course the mango season is best, so please inform me so I can make out my schedule, and you can make all arrangements. Do you have the pictures of Prahlada which you painted some years ago? I think they may be published in BTG, but they have been missing. Please offer my blessings to Govinda Dasi and to all the boys and girls there in New Navadvipa. Hope this will find you in good health. Please accept my blessings. I beg to acknowledge receipt of your letter addressed to Gargamuni dated ``nil,'' along with a new set of beads. I have conveyed the letter to Gargamuni after learning from it that you have lost your original set of japa beads and request me to chant on these. So I have duly chanted them as you have desired, and they are returned herewith enclosed. However, in future, please be very careful to keep these sanctified beads. You should be more heedful. Now be sure to chant at least the prescribed sixteen rounds daily without fail, avoiding the ten offenses to the Holy Name, and thus advance in spiritual strength. Please accept my blessings. I have just received one note from Brahmananda which informs me that your original set of beads was lost in the mail and did not arrive in the packet with your letter of initiation. Brahmananda has sent one set of new tulsi beads, and I have duly chanted upon them and I am sending them to you enclosed herewith. I hope you are doing well in Buffalo under the guidance of Rupanuga Prabhu. Please be sure to chant at least sixteen rounds of the Holy Name daily and be happy. 1. Pg. 9 line 14 you can make it Karatieya. 2. Pg. 9 line 15: In my Srimad-Bhagavatam it is written Sri Sailam. At that time it was known as Sailapura, and now it is known as Solapura. It is still a pilgrimage in Mahar, and because Balaramaji was traveling in South India, this is Solapura is in South India. 3. Pg. 9 line 18; yes, Dravidadesa is correct. 4. Pg. 9 third paragraph: Bvankatachaila is incorrect. It should be Venkatacala. Please offer my blessings to your good wife, Arundhati. I hope you are both in good health. N.B. Regarding point #2: you can put the present name ``Solapura'' and then in parenthesis (Sailapura). Please accept my blessings. Very, very much thanks for your laddus. They are very, very tasteful, and we have eaten with great relish. Still they are in stock, and I shall go on eating. Deity worship means to be very, very clean. You should try to bathe twice daily. The Deities should never be approached without having bathed first and changed to clean cloths after passing stool, etc. Keep teeth brushed after each meal, fingernails clean and trim. Be sure that your hands are clean before touching anything on the altar or the Deities. And cleanse the Deity room, altar and floor daily thoroughly. Shine the various Aratrik paraphernalia after Aratrik. This is described in the booklet for pujaris written by Silavati Dasi. The idea is summit cleanliness--that will satisfy Krsna. Regarding your dream, it is a great blessing to you that Krsna warned you. So you should never be negligent. Always be careful, then in due course you will feel the Bhava. Please offer my blessings to your good husband, Bharadraja. I hope both of you are in good health. Please accept my blessings. I beg to acknowledge receipt of your letter dated 19 March, 1970, and have noted the contents. Yes, I am very glad to learn that Hamsaduta and Himavati have arrived with Tamala Krishna, and they have in such short order set up a good program of activities. So now your Deities are being cared for under Himavati's direction, and Sankirtana Party is more successful led by Hamsaduta and Tamala. Now with this good organization please continue to work combinedly for spreading our Krishna Consciousness movement throughout Germany. You have said that there is such great scope for preaching there, so I am very hopeful that you will be very eager to carry out this preaching work, starting many new centers. Our first business is this preaching work, especially to organize centers, and you write to say that now this spreading potency will be utilized, so you should join wholeheartedly in this program. If you think that the time spent for studying 2 1/2 years more can be better used immediately to push our Krishna Consciousness movement, then you can turn your efforts in this direction. That will be very nice. Thank you very much for sending the article, which appears to be very nice. Unfortunately, none of us is able to read it. And thank you also for the enclosure of $15 as contribution to my maintenance fund. Please offer my blessings to Jaya Govinda and Sadanandini for their being united in Krishna Conscious service. When I first saw this girl in Buffalo, I wanted her to get married with a nice boy, and I am happy that Jaya Govinda is chosen for this purpose by Krishna. So I think they are very nice combination, and let them work jointly with great enthusiasm. I think both you and Sivananda should marry some German girls if they are Krishna conscious. Please offer my blessings to all the other boys and girls there in Hamburg center. I hope this will meet you in good health. Please accept my blessings. I beg to acknowledge receipt of your letter dated 17 March, 1970, and noted the contents. In the meantime, I have also received your note dated 18 March, 1970, along with the new set of beads for Nityananda Das. I do not know how they have been lost from the packet in the mail. But I have duly chanted this new set, and they will be sent securely wrapped. Regarding printing of KRSNA on the cover and Title, it should not be ``KRSNA Book,'' but it should be ``KRSNA'' in large type on the first line, that is the Title, and on the second line, by way of adjective, ``The Supreme Personality of Godhead'' should be printed in smaller type. Regarding the salesman's statement that the printing would take 8 months, so we cannot wait for 8 months. They have given reference in their letter No. ODCUMIS-L/70-115, dated 5 February, 1970, as follows; ``we would like to show you our rough schedule of typesetting, Printing and binding. So that is a total of 85 days or in other words about 3 months. Now why are they asking so much time? Therefore do not accept a new schedule, which may be 8 months, because we have already received the schedule from Mr. Haru Kugimoto, who is head of their Overseas Division, and his word should not be overruled by that of a salesman. Regarding picture pages, sections of 8 pages together is not nice. The pictures should be just at the appropriate place of description in the text. There are many modern glues which will not loosen for a very long time, so glueing is not a problem. I think that this method of insetting the picture pages is best, and even better if they can be each protected by a leaf of waxed paper also. That will be best. So do what ever you think is best for getting the book ready (printed) as soon as possible. Regarding the almanac, all your subjects included are approved by me. So there is nothing to add, just see that it is finished printing before Lord Caitanya's Appearance day. I have received the new issues of Easy Journey, and I have very much appreciated the color picture on the cover. It is very much improved. Please offer my thanks to Advaita and his assistants. I think all our books can be printed in such small booklets, part by part, and they will be easily saleable. Take for example TLC. If we issue part by part like that, it will be about 5 books. So people will easily buy, and our purpose will be served. Discuss the idea with your colleagues. Somehow or other, we shall overflood the market with Krishna Conscious literature. That will create our prestige, and being cheap distribution, many people will learn our philosophy. Another point is that while BTG is delayed, you can sell these. I am very glad to learn about New York's situation. New York must have a nice Temple as Los Angeles as soon as possible. That will be prestige for New York City. Next weekend, you can transfer my bank money, as addressed by you personally. Regarding color pictures in Nectar of Devotion, this will be nice because Advaita has improved. Even the quality of Easy Journey will do, but I hope he will improve more. 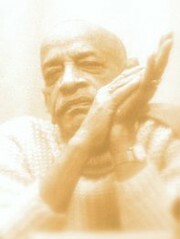 Please offer my thanks to Advaita and all the others for taking so much trouble for Krishna Consciousness literature. The address which you have received from Readers Digest is not the same address as I gave you, but whatever it may be, they are a large agent, and you can open correspondence as our distributer in India and settle terms. Send them some selected copies of BTG. Thank you for the enclosure of the picture printed in ``Horizon'' Magazine, it is very nice. Was there any description printed along with the picture? Please accept my blessings. I beg to acknowledge receipt of your letter dated 16 March, 1970. Regarding your question about the art department, for the present we should finish the pictures for KRSNA first. Then, if there is opportunity, they can print pictures for Nectar of Devotion. Both are required, but most important is KRSNA. It is better to have pictures in all our books, as many as possible. I have received two copies of Easy Journey, and Advaita has done this picture cover and it is very much advanced. So he can print pictures in NOD. The printing of Easy Journey is very encouraging. I think that the second part of KRSNA should be printed in our own press. Yes, be engaged always in Krishna's duties, and you all members, husband and wife, family, friends, brothers, and sisters, all combined will feel transcendental bliss. Please accept my blessings. I beg to acknowledge receipt of your letter dated 12 March, 1970, along with a poem ``All glories to Sri Gurudeva . . .'' etc. This poem and your many other writings give me the impression that you are naturally thoughtful and philosophical, and thus I am very much hopeful that in future you can give to the world many nice things presented to the understanding of the thoughtful men in this age. In that way, I wanted you to live with me and be engaged in writing such things, getting ideas from me. But we will have to wait for a few days more, and then I shall ask you to leave completely from your present occupation in the university. At present, you patiently work there and get as much money as possible for developing New Vrindaban. As I recommend to every householder, if you spend 50% of you income for Krishna's business in developing New Vrindaban, and a similar amount is collected by Kirtanananda Maharaja, I think there will be no need of financial help from other centers. I have inquired yesterday of Gargamuni whether he has any response to his appeal for money to other centers, and he said there was none. So I don't think other centers will be able to help another center for developing. Each center has to manage its own affair independently. But I think if Kirtanananda Maharaja as well as you try to introduce our books for study in the university classes, especially in the religions department, that will be very nice and you can get good income out of that. Kirtanananda Maharaja has already introduced to one college, similarly Brahmananda has also introduced in some college, and in each place they have sold more than 40 copies of TLC. So the potency is there because these books are not ordinary literature, being based on Vedic philosophy they are in a way a new line of thoughts to the Western world. And those who are really interested in spiritual understanding surely will appreciate. But for this introduction I don't find anyone just competent except yourself and Kirtanananda Maharaja. So you can think over this matter and Krishna will show some way out. Another thing is that there is a 90% chance of my going to India early next year. When I go, if you accompany me I will very much like it, provided you are free. Now for New Vrindaban, if there is no immediate necessity for purchasing the side properties, you just wait for another year, and keep in a separate bank deposit for this purpose, and similar amount collected by Kirtanananda Maharaja. In this way, in one year I think you can accumulate this 5000 to 7000 dollars or even it is a little less, at that time, I shall try to complete it someway or other. Our next attempt would be to present the brochure with all different pictures of our centers to the foundations and attract their attention. Our program is sublime. Our philosophy is practical and authorized; our character, the purest; our program, the simplest; but our ultimate goal is the highest. Similarly, we have to convince people of your country. They are intelligent, well to do, and receptive. Why not try this program combinedly, yourself, Kirtanananda Maharaja, and Brahmananda. I think in New York there are so many foundation offices. If you all three or four together, you can add also Subala, it will be nice combination. If the foundations understand that actually you are doing something nice, then the financial difficulties for developing our various centers will be over. Please offer my blessings to Syama dasi, and I hope this will find you in good health. Please both of you accept my blessings. I beg to acknowledge receipt of your note dated 30 February, 1970, along with one check for $100 to my book fund account, and thank you very much. I am very happy to learn that you are living and working together happily as Grhasthas. Now use this opportunity of household life, not for sense gratification, but for mutually working to perfect your Krishna Consciousness. I am also glad to note that you are eager to bring up many souls in Krishna Consciousness, and that is a very encouraging and responsible program. Just one good soul fully developed and firmly convinced in preaching Krishna Consciousness can reclaim so many fallen souls for going back to home, back to Godhead. And the best way to prepare such Krishna Conscious souls is to train them to up from their birth to follow the principles of Krishna Consciousness. This is possible by good association of devotee parents, so you must keep always fit in spiritual strength by following the regulative principles faithfully and chanting the sixteen rounds of beads daily without fail, then Krishna will give you more intelligence how to engage yourselves more and more in His service, and your lives will be sublime. Please accept my blessings. I have not heard from you since a long time. I hope you are doing well. You are a very sincere worker, and Krishna will bless you. I will be glad to hear from you. Please accept my blessings. I beg to thank you for the six volumes of our BTG magazines which you have bound up and sent to me. You have done it very nicely, and I am keeping them installed in my bookshelf for convenient reference. I do not think it is necessary to make any slip-cases as you have kindly offered. But in future, the magazines may be bound up by the full year and you may enclose in the binding also an index for the year's articles. Soon our BTG will also be printed in other languages, and it will be nice if you can also bind these in similar sets as the English BTGs. I am very glad to know that your pen is inspired to create, because we are in need of many intelligent writers who can express our Krishna consciousness philosophy nicely just following exactly the transcendental words and purports of our vast Vedic scriptures according to the previous Acaryas of our Gaudiya Vaisnava Sampradaya. And if you continue to work in this writing and publishing of our literatures with steady enthusiasm and sincerity, your success in Krishna Consciousness is certain. Therefore to keep your spiritual strength, always observe the regulative principles strictly and chant at least sixteen rounds of beads daily without fail. This is essential for understanding our philosophy practically to advance in Krishna Consciousness. And we should always avoid mental speculations.